My name is Josée, I’m the mother of 2 wonderful children , I am originally from Montreal (Canada) and have been living in Huddersfield for nearly 11 years. I am the current volunteer coordinator for the sling library and I help with admin and fundraising. When I was pregnant with my first, I wondered where we would store a pram in our house. I looked at parents struggling to get the bus with a pram, sometimes not having space for them to get on and having to wait for the next. 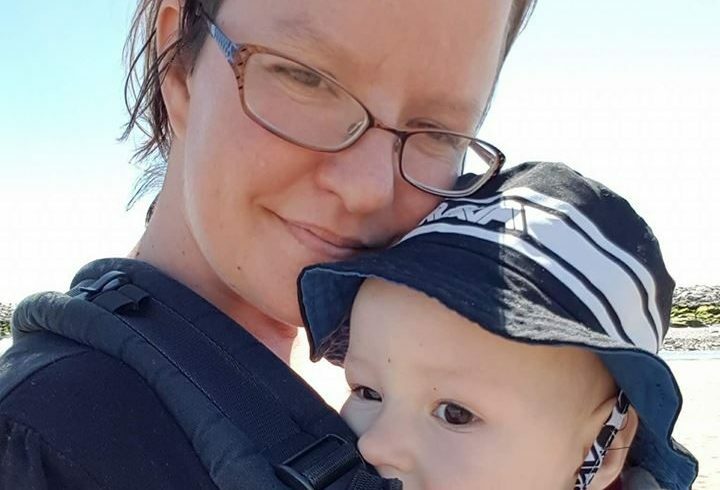 As I didn’t drive at the time and we didn’t have a car, I was worried that the frustration of public transport with a baby would make it difficult for me to go anywhere after giving birth. Thankfully, an old acquaintance from high school introduced me to the wonders of slings and babywearing. I was fascinated. She told me about sling libraries and my first thought was that there most likely wouldn’t be one in my town. I googled Sling Library Huddersfield and I was absolutely amazed to see we had a local one. I contacted Yolanda by email straight away and she came to my house to show me and my husband how to use slings and the benefits of babywearing. We fell in love with a wrap and we were hooked. 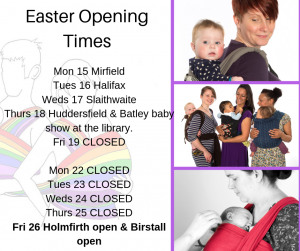 I spent a lot of my time as a new mum hanging out at the sling library to meet other mums, to gain confidence breastfeeding in public and to learn more about slings. 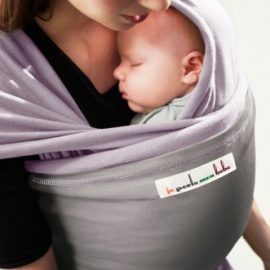 I carried my daughter in a wrap (stretchy, hybrid or woven) until she was 20 months old when I switched to a buckle carrier for back carries. I continued carrying her until I was 16 weeks pregnant with her brother (she was just over 3yo) and am still carrying my son now (2.5 yo) and hope to continue for as long as it is mutually beneficial. As a way of showing my gratitude for the valuable impact that the sling library had on my journey into motherhood, I volunteered at several sling library sessions. After starting a wonderful new job, it was difficult for me to continue in that role, but Yolanda asked me if I would like to help as a volunteer coordinator and I accepted. I am also helping with fundraising and other admin tasks as necessary. I pop in at library sessions whenever I can, but generally work from home. If you would like to volunteer for the sling library, please contact us on Facebook. We are always looking for new people to join our team.